In 2017, a clinical disease outbreak resulted in substantial mortality of adults and larvae of cultured Chinese rice-field eels (Monopterus albus) on a farm in Hubei, Central China. A rhabdovirus was isolated from moribund specimens, and typical clinical symptoms associated with an outbreak included an enlarged and swollen head. This differed from previous observations. Histological changes included necrosis and cavities of various sizes within the brain and kidney. Homogenized tissues of diseased Chinese rice-field eels were screened for viral isolation using six different fish cell lines. A rhabdovirus was isolated following observation of cytopathic effect (CPE) in a gibel carp brain (GiCB) cell line and confirmed by RT-PCR. 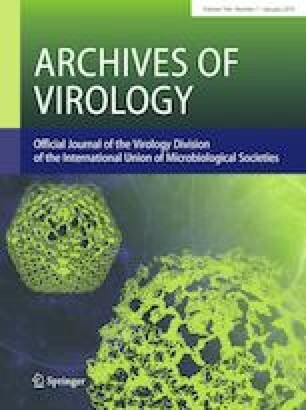 Electron microscopy showed large numbers of rhabdovirus-shaped particles in the cytoplasm of the brain cells of the diseased Chinese rice-field eels and in the infected GiCB cell line. This virus has been named “Chinese rice-field eel rhabdovirus” (CrERV), and the complete nucleotide sequence of CrERV was cloned. This rhabdovirus is composed of 11,545 nucleotides with the following genomic organization: 3′-N-P-M-G-L-5′. The genes are separated by conserved gene junctions, and phylogenetic analysis of the L sequence revealed that CrERV forms a separate branch with Siniperca chuatsi rhabdovirus (SCRV) and hybrid snakehead rhabdovirus C1207 (HSHRV-C1207). This is the first report of the complete sequence of CrERV from the Chinese rice-field eel in China. Wenzhi Liu and Yuding Fan and contributed equally to this paper. This work was supported by the Central Public-Interest Scientific Institution Basal Research Fund, CAFS (grant numbers: No. 2018JBF01; NO. 2017HY-ZD1005) and the Science and Technology Support Program of Hubei Province (grant number: 2015BBA234). The study was performed in strict accordance with the Guide for the Care and Use of Laboratory Animals Monitoring Committee of Hubei Province, China, and the protocol was approved by the Committee on the Ethics of Animal Experiments at the Yangtze River Fisheries Research Institute, Chinese Academy of Fishery Sciences. The Chinese rice-field eels were euthanized for 20–30 min in 1 mg of MS-222 (Sigma) per ml to limit their suffering before tissue collection.